We recommend checking out our discussion threads on the MIPRO MA-303du Dual-Channel Portable Rechargeable MA-303DU (6A), which address similar problems with connecting and setting up Portable PA Systems MIPRO. The user manual for the MIPRO MA-303du Dual-Channel Portable Rechargeable MA-303DU (6A) provides necessary instructions for the proper use of the product Pro Audio - Live Sound - Portable PA Systems. The MA-303du Dual-Channel Portable Wireless PA System from MIPRO is designed for live sound reinforcement applications with small- to medium-sized crowds, such as for schools, places of worship, corporate training, paging, trade shows, street performances, fitness instruction, and other comparable situations. This portable 6 pound PA system can be hand-carried using the fixed carry handle or mounted on a microphone stand. It will last up to 9 hours when powered by its built-in lithium rechargeable battery and can recharge in approximately 4 hours. A 4-level battery indicator displays the status of the battery and the unit may also be powered by an AC adapter. For sound amplification, the device uses a 60W Class-D amplifier to drive a 5" low frequency woofer and a 1" high frequency tweeter. A 1/8" (3.5mm) input jack allows for connection of an external MP3, iPod, CD player, or other line level source. A built-in USB music player and recorder with remote control allows for direct connection to a computer, and an LCD display shows the track name, number, time, and recording status. An alarm button can also be engaged to generate an emergency warning siren sound. A 1/8" (3.5mm) output jack allows for connection to the input of an external sound device. The PA system features two integrated UHF diversity wireless microphone receivers with 16 selectable channels as well as auto scan and transmitter sync functionality. This model operates on the 6A: 620 to 644 MHz band. Alternatively, a wired microphone can be connected using a 1/4" (6.3mm) unbalanced microphone input. 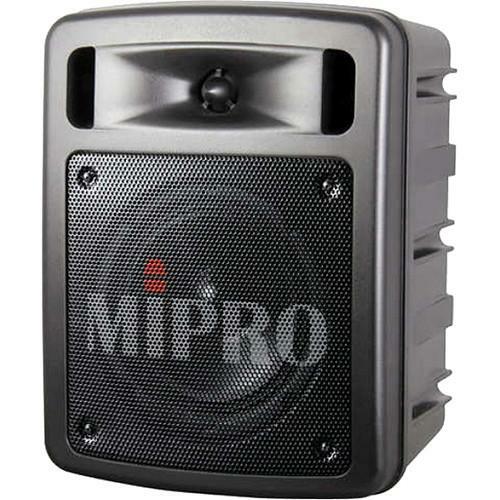 If you own a MIPRO portable pa systems and have a user manual in electronic form, you can upload it to this website using the link on the right side of the screen. The user manual for the MIPRO MA-303du Dual-Channel Portable Rechargeable MA-303DU (6A) can be downloaded in .pdf format if it did not come with your new portable pa systems, although the seller is required to supply one. It is also quite common that customers throw out the user manual with the box, or put the CD away somewhere and then can’t find it. That’s why we and other MIPRO users keep a unique electronic library for MIPRO portable pa systemss, where you can use our link to download the user manual for the MIPRO MA-303du Dual-Channel Portable Rechargeable MA-303DU (6A). The user manual lists all of the functions of the MIPRO MA-303du Dual-Channel Portable Rechargeable MA-303DU (6A), all the basic and advanced features and tells you how to use the portable pa systems. The manual also provides troubleshooting for common problems. Even greater detail is provided by the service manual, which is not typically shipped with the product, but which can often be downloaded from MIPRO service. If you want to help expand our database, you can upload a link to this website to download a user manual or service manual, ideally in .pdf format. These pages are created by you – users of the MIPRO MA-303du Dual-Channel Portable Rechargeable MA-303DU (6A). User manuals are also available on the MIPRO website under Pro Audio - Live Sound - Portable PA Systems.